It's easy to use. The software can be installed in just a few seconds. Simply plug the Cassette Player and press play and it will start recording instantly. In addition, the Cassette Player is powered directly from the USB so there’s no need to worry about battery. Reproductor MP3 Adaptador Casete Cinta Convertidor CD Player Radio a iPOD. Cable Convertidor de audio digital a analógico Coaxial óptico Toslink Adaptador. 1 x convertidor de cassette a mp3. Fácil de usar y puede transferir el archivo MP3 a cualquier reproductor de MP3 para escuchar o grabar en un CD. Marca - Senza marca/Generico - MPN Non applicabile EAN Non applicable UPC No aplicable ISBN Does not apply. Nombre del producto: captura de cassette usb. software audaz: uso de software para convertir cintas de cassette a MP3 digital. La salida de audio le permite escuchar en sus auriculares u otro sistema de altavoces. Cassette usb audio convertible de cintas de música a mp3. Salida de audio le permite escuchar en su estéreo, auriculares o sistema de altavoces. Un puerto USB 2.0, CPU Pentium 4 o superior. Se reintegrará el valor del artículo una vez devuelto, pero no los gastos de envío. Redescubre tus viejas cintas de cassette en el camino. Salida de audio le permite escuchar en su estéreo, auriculares o sistema de altavoces. Un puerto USB 2.0, CPU Pentium 4 o superior. Viene con el software convertidor de cinta que le guiará para hacer la transferencia. Description: This usb audio digitizer audio converter lets you easily record live audio or transfer analog audio into a computer in selectable digital formats such as MP3, WAV so you can listen your newly-created digital music on MP3 player, computer, portable CD player, or car stereo or home stereo system. Great tool to capture and edit audio to digital format on your computer before transfer to iPod or iPhone or other portable audio players. This easy-to-use USB converter provides users an easy solution to digitize analog audio feed into digital format through the convenient USB interface. There is absolutely no driver installation needed at all for operation in Windows, Mac and Linux OS. . Cassette Player♬ 【 It's Easy To Use】--Simply put in the cassette tape, connect it to PC and use the supplied software to convert the whole tape into MP3 format. ❤With the Tape to PC Recorder USB Walkman Cassette Player, you can convert all those cassettes into digital MP3 files. 1X Convertidor de cinta casete a MP3 1X Auricular 1X CD 1X Cable USB 1X Manual de instrucciones en inglés Marca MP MPN MP EAN No aplicable. ENVIVO Cassette Converter NEW. Battery or Usb. CD with Software. Takes 2 AA Batteries if using batteries. 1 x captura de cassette USB. - Diseñado para parecerse a un reproductor de cassettes de la vieja escuela. Formato convertidor: MP3. Formato de grabación: Mp3. Canal de audio: estéreo L / R. 1 x cable USB. 1 reproductor de cassette USB. Viene con software de convertidor de cinta para guiarlo a través de la transferencia. Formato de grabación: Wave, MP3. 2 Batería AA (no incluida) o operación USB. Nombre del artículo: USB Cassette Capture. El puerto USB admite formatos FAT, FAT32, exFAT hasta 64G. 【Convertidor de cassette a MP3】 - Convierta música de cassette a formato MP3, no requiere computadora. ¡IMPORTANTE! ¡Garantizamos su satisfacción! 1 x convertidor de cinta de cassette a MP3 (sin cinta). 1X(Redescubre tus viejos casetes de cinta sobre la marcha. Conectese con LP / Vinyl, capture archivos de audio en formato MP3 en su computadora. ). Con el reproductor de casete Walkman USB de la grabadora de cinta a PC, puede convertir todos esos casetes en archivos MP3 digitales para usar en su computadora, iPod o en el automóvil. El USB Cassette Capture es un reproductor portátil portátil de cinta USB que funciona con todo tipo de cintas. Converts your precious cassette collection to MP3. - Can be used as personal cassette player. - USB Cassette Player. - Recording Format: Wave, MP3. - USB Cable. - One available USB 2.0 port. - User Guide. LECTEUR CONVERTISSEUR CASSETTE EN MP3. Inclus : notice en français, cd avec drivers notice logiciel conversion, câble USB. Fonctionne avec 2 piles (2x AA non fournies) ou via l'USB. Compatible windows 7 / XP / Vista / 2000 / 8 / 10 - Plug and Play : drivers non nécessaires. Features:Convert your old mix tapes and cassette to MP3 to Playback on iPod/MP3 player or burn to CD.Plug and play USB device, no drivers required.Audio output enables you to listen on your stereo, headphones, or other speaker system.Audio editing software included.Rediscover your old cassette tapes on the go.Descriptions:Portable design fits in virtually any bag and enables you to play and transfer anywhere.Flexible battery or USB-powered operation.Comes with tape converter software to guide you through transfer.System Requirements:For Pentium 4 1.7 GHz CPU or above512MB RAM or above1GB free HDD spaceVGA card with 32MB memoryOne available USB 2.0 portCD-ROM for installationFor Microsoft For Windows 2000/ XP/ For Vista/ For Win 7Specifications:Color: black&a. Tampoco reproductor de cassette y convertidor de USB. Old cassettle to usb. Envivo Mini Cassette Converter to USB Digitaliser. 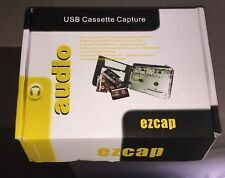 Like new (box opened but device never used) *Convert your old cassette tapes into digital files *Can be used as normal WalkMan™ Including: -Cassettle converter. -Headset. -Usb Cable. -Cd with software. -User manualA -2x AA batteries. ** The warranty is NOT included ** Dispatched with Royal Mail 2nd Class. 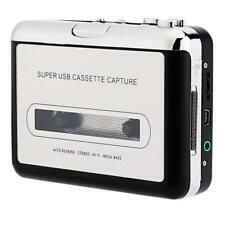 Tape to PC USB Cassette-to-MP3 Converter Adapter Audio Music Player walkman. Full working order, in great condition. Requires USB cable. This device allows you to play your old tapes and also convert them into MP3s - this digitisation can be done via PC. Includes: 1x cassette converter, 1x earphones, 1x USB cable,1x instructions. Just plug and play via the USB connection, no driver required: connect the tape recorder to your PC, install the software and you're done! Rediscover those old songs with Tape To Digital by turning your tapes into MP3's to listen on your computer, iPod or in the car! Tape to Digital is a portable, handheld USB tape player that works with all kinds of tapes. Cassetten Player mit USB Anschluss von LogiLink. Geeignet zum Digitalisieren von Audio Kassetten über den USB Anschluss direkt am PC / Notebook. PORTABLE CASSETTE PLAYER MP3 DIGITALISIERER USB - AUDIO SONGS DIGITALISIEREN. If you grew up listening to your favorite bands on a cassette tape, you know there's nothing quite like the sound of strumming guitars and thumping bass as it poured through the headphones of your shiny new Walkman. Do you still have an extended collection of tapes?. 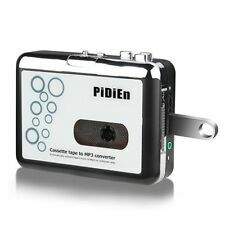 With this cassette-MP3 converter you are able to enjoy them once again. When you connect this adapter to your PC you will be able to convert your tapes to MP3 and enjoy them wherever you are. USB - Kodak. USB - Minolta. USB - Mustek. USB - Nikon. USB - Olympus. USB - Panasonic. USB - Ricoh. USB - Samsung. Cassette Player♬ 【 It's Easy To Use】--Simply put in the cassette tape, nnect it to PC and use the supplied software to nvert the whole tape into MP3 format. ❤With the Tape to PC Rerder USB Walkman Cassette Player, you can nvert all those cassettes into digital MP3 files. Nuevo, alta calidad. Funciona con dos AA pilas o con USB cable. Se puede utilizar también como un reproductor con salida Jack 3.5mm. 1X Convertidor de cinta casete a MP3. Este convertidor lleva un software de audio de edición, La salida de 3.5mm jack hace que puede escuchar los audios estéreos por los auriculares o otros sistemas. Cassette Player With this kind of cassette tape to MP3 converter, you can easily convert your old tape to MP3 without a computer. Cassette Player♬ 【 It's Easy To Use】--Simply put in the cassette tape, connect it to PC and use the supplied software to convert the whole tape into MP3 format. El puerto USB admite formatos FAT, FAT32, exFAT hasta 64G. 【Convertidor de cassette a MP3】 - Convierta música de cassette a formato MP3, no requiere computadora. Recording digital/ digital 2 analog: PC audio from/to cassette, or AM/FM to PC/cassette. Enjoy your classic music tapes through this Personal Cassette Player from DigitNow. 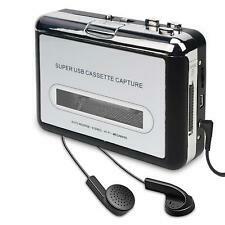 USB Cassette Player Personal Audio Recorder with Speaker, Radio Recording Cassette Tape to Digital MP3 Converter. Cassette De Cassette, reproductor USB a mp3 Converter capturar guardar en flash drive Dir.. Cassette Player With this kind of cassette tape to MP3 converter, you can easily convert your old tape to MP3 without a computer. Can partition each songs of tape automatically, long press the "Next" button 3~5 seconds,to change the mode. Convert anywhere - Powers via Battery or USB and features an ultra-portable slim-line design ,perfect for playback and conversion on-the-go. The Ion Tape2Go lets you turn your tapes into digital files to listen to on your computer, iPod, or in the car. Envivo Cassette Player and to Usb Converter.